An important part of being an entrepreneur is making sure you walk the walk, as well as talk the talk. Starting a business is always going to be hard - but the current state of the economy almost worldwide means that now is an especially treacherous time to be embarking upon such a venture. Sure, there are challenges - but none are unsurmountable. I am a walking, talking, high-fiving example of how other people's negative attitudes cannot and will not stand in your way if you want something enough. Whilst I defiantly went out and damn well made it happen, I recognise that such actions do not come easily to everyone. Sometimes people need a spot of encouragement, some inspiration, a little nudge to help them take those first steps. And - even once you've thrown yourself into it - running a start-up is an endless rollercoaster of mind-blowing highs and sleep-destroying lows. It never ends - even when you're a high-flying, successful business person, (I assume!) it's still not always easy. I guess what I'm trying to say is; sometimes everyone needs a little inspiration, support and motivation. And events like Entrepreneur Week are places for entrepreneurs new and established, old and young, to come together. When Shell LiveWIRE asked me if, as a 2011 Young Entrepreneur of the Year finalist, I would like to attend the event as part of the UK delegation organised by Young Brits, I was really excited. I feel really passionately about both encouraging entrepreneurship amongst others and in widening my horizons. So a few days later, I was on a plane to Athens! A few of my friends and family raised concerns about the recent rioting and protesting in the city, but I figured if there was an Entrepreneur Week event running, there was obviously hope. The Entrepreneur Week website states; "We believe there is a mounting global shift toward placing entrepreneurship as the core focus of economic policy and programming in countries around the world. At more than any other previous time in history, entrepreneurship has eclipsed the world stage as central to most nation’s efforts to rebuild their economic stability. Leaders are eager to unleash entrepreneurial potential as an economic growth engine and source of job creation." This is especially striking and relevant for Athens at the moment due to the recent aforementioned troubles, so the event was impeccably timed in that respect. It was strange to arrive at our hotel, located a mere hundred yards from the Parliament building, and see the city square I'd watched fill with angry rioters on TV only a few days before. But I witnessed nothing violent - I observed a few peaceful protests, frustrated citizens raising their concerns to their Government. At no point did I feel unsafe or in any danger. My experience as a visitor Athens as a city was a positive one. The event kicked off on Thursday. A really poignant quote I heard from during the opening speeches was; "The crisis in Greece is not a financial one, it is a political one". I really liked this as it felt optimistic and hopeful and, in my opinion, kicked the summit off to a really good start. We weren't there to talk about the Euro bail-out or the staggering GDP, we were there to discuss opinion and drive change. It lines up perfectly with my opinion of how entrepreneurship should be - get the passion, the people and the objectives right, and worry about the numbers as a secondary concern. What really stood out for me was the message delivered by Gary Whitehill, the Founder of Entrepeneur Week. He spoke about how passion is scalable - again, related slightly back to the point I made above. Get the drive and the determination there, and you are unstoppable. My favourite quote of his was "save the entrepreneur, save the world" - I felt it really drove home the message we were in Greece to share; that entrepreneurship can save a floundering economy and turn it into something incredible. He made the point that, if you take people who are passionate (but don't necessarily know what they are doing) and put a framework around them, amazing things can happen. More on this later! Gary also participated in panels on the second day; I found him very inspiring, he was definitely my favourite speaker from the event. After networking drinks in a somewhat eccentric Greek bar that evening, day two kicked off. The highlight of this day for me was one of the later sessions in which our UK delegate leader, Alex, was participating. It was titled "The Battle for Athens Centre: Turning a crime zone into a field of creativity". The panel sparked off a really interesting debate in which the audience engaged enthusiastically. How can something destructive be harnessed and then channeled into something more productive? And what steps do we need to take to begin implementing that shift in attitude? 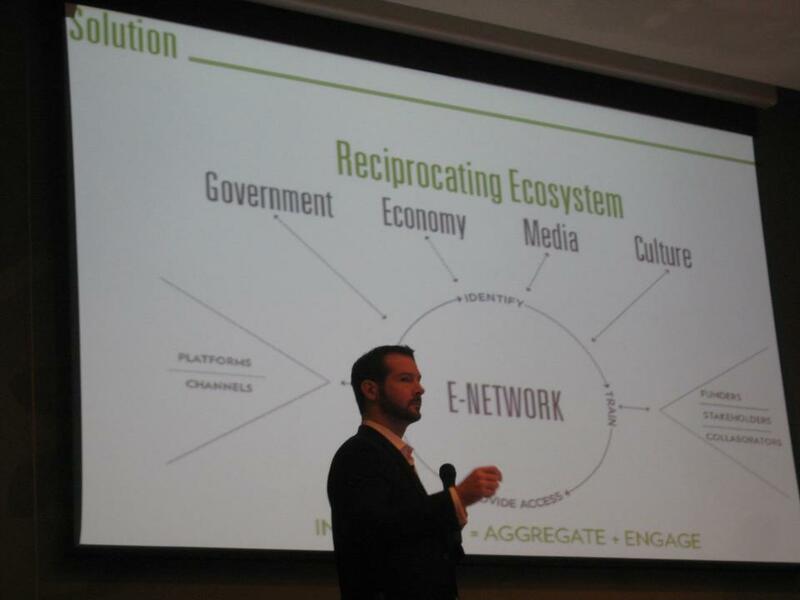 This panel also featured Alvaro Cuesta, a Spanish delegate from Madrid who runs a business incubator. I'd been chatting to him earlier in the day and was really shocked to learn that, in Spain, business owners are charged €200 a month of corporation tax from the day their company is formed. Horrified, I tweeted about it and kicked off quite an interesting discussion on Twitter. A Greek business owner told me it was a similar story in Greece; entrepreneurs are charged €250 bimonthly per founder, which increases as the company grows in maturity and profit. One entrepreneur who responded is 7 years into his business and now pays €700 every other month in tax. Realistically I am not knowledgeable enough to comment on Greek politics, but I can't help but feel that if entrepreneurism is to truly flourish in Greece, this sort of legal structure needs to be revisited. In the 'crime to creativity' session I felt huge empathy for the people I'd seen on the street earlier that day who are troubled by the economic situation in Greece. If you are angered by financial cuts and similar, is entrepreneurship truly going to feel like a desirable and achievable avenue if you are instantly hit with a monthly fee of hundreds of euros? I can say with absolute certainty that there is absolutely no way I would still have my company had I been subject to a similar system. Can anyone truly drive change and hope for an entrepreneurial revolution whilst still allowing archaic and intimidating clauses to inhibit growth? This revelation has made me feel incredibly lucky for everything the UK affords me. I have been supported and encouraged on so many levels since I started out, and organisations such as Shell LiveWIRE and others add an extra framework around young entrepreneurs like myself. I believe Greece could really flourish if similar support was made available to young entrepreneurs. At the Temple of Olympian Zeus. Turns out I look even tinier than normal when standing next to ancient Greek ruins. After a morning of power sight-seeing of Athens by some of the UK delegation Saturday afternoon held a few hours of B2B networking for the delegations from the UK, USA, Belgium, Russia, Serbia, Spain, Hungry, Australia, Portugal, Saudi Arabia and of course, Athens. This was one of the best parts of the event for me - having the opportunity to network with such an eclectic and international collection of people is an opportunity which doesn't present itself every day. I met some incredible people whom I definitely hope to work with in the future. The things I am taking away from Entrepreneur Week Greece are feelings of hope, gratitude and the re-confirmed belief that passion is the key to driving entrepreneurial growth. One of my main observations from the experience was that there was an evident shortage of young people. The UK delegation was by far the youngest - to the extent people were commenting on how amazing it was that we were there. I would really have liked to have seen a greater youth presence because I think we could have really inspired them and encouraged them to think outside the box. Regardless, I am confident that the foundations are being laid for great things. I particularly enjoyed chatting to Stavros Messinis, founder of CoLab, a business incubator in Athens. He is an inspiration to his country and I believe he will be a driving force in enhancing enterprise in Athens. All in all, Entrepreneur Week Greece was an incredible experience and I feel really privileged to have been asked to be a part of it. I have returned home feeling completely exhausted, but my brain is buzzing and I have been inspired by both the people I met and the presentations I watched. 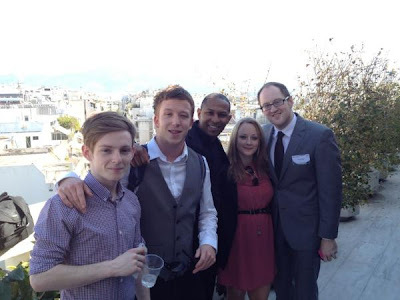 My fellow delegates - Marty, Nathan, Glynn, Alex and Nathaniel, are an incredible bunch of people and I couldn't have asked for a better gang to network, explore ancient Greek ruins and shake maracas in questionable bars with. On the flight home, I was flicking through the Aegean Airlines in-flight magazine and was really pleased and inspired to see a feature on the recent TEDx event run in Athens. I mentioned earlier that Gary had said sometimes all it takes is a framework to bring out the best in people, and it made me smile to see that it's already starting to happen for Athens. Whatever the news channels are playing on your TV - entrepreneurship will prevail in Greece. I know it's there, because for three days, I was a part of it. Many thanks to Dimitris Tsigos, everyone on the EW Greece team, Gary Whitehall and The Hellenic Start-Ups Association for making it all happen, and of course to Shell LiveWIRE and Alex Mitchell for the opportunity to go. You have inspired me, excited me and compelled me to work even harder. I graduated from university in Summer 2010. Unlike the previous year's cohort, I didn't quite walk into the darkest months of the recession - but I didn't exactly bound into the working world as a shiny new Bachelor of Science and drown in amazing job offers, either. My exit from education saw me enter a working world that was tentatively trying to keep itself ticking over, bravely trying to hold it's head above the water and prevent another downturn. When I decided I wanted to start my own business, I was somewhat afraid to say it out loud. My fellow graduates were all frantically job hunting - some gratefully accepting any role they could get - so it seemed almost selfish and whimsical to confess I wanted to do something my own way instead. Truth be told, it received a mixed reaction. My parents, after patiently supporting me through my six years of university (yes, six, you read that correctly) looked like they didn't know whether to laugh or cry. Some of my friends told me it was a "great idea!!" but I could see the looks of "rather you than me, I'll keep job-hunting thankyouverymuch!" flashing across their faces. Sadly, a lot of people were negative about it. My product, Pillow Talk, is obviously very technology-driven and required a lot of initial development funding and I met many people who deemed this a good enough reason to not even try. "We're in a recession" they told me, "you'll never be able to make it happen". Well, the joke was on them because within two weeks of officially forming my company, I had Government backing and the funds in place to develop a proof-of-concept prototype. Someone gave me a chance and it was all I needed - and that's how it works. I'm running a start-up now, but it is me - and others like me - who will go on to create jobs and opportunities. This week I am visiting Greece as part of the UK delegation attending Entrepreneur Week Greece. I was offered the opportunity by Shell LiveWIRE and I couldn't say yes quick enough. I love enterprise events and meeting other young people who are facing the same challenges as me, so the idea of doing that in another country was naturally very appealing. It may sound silly, but having previously only networked a lot in the UK, having the opportunity to travel abroad feels a lot like I'm stepping up my game! I'm also very proud to have been chosen to represent the UK as an example of a successful young entrepreneur - it's a big honour and a big responsibility. I am in Athens with four other young entrepreneurs; Marty Bell, Nathaniel Peat, Glynn Pegler and Nathan Dicks, headed up by Alex Mitchell, Co-Founder and Chairman of Young Brits. Starting today, we will participate in three days of panels and discussions about the positive impact entrepreneurship can have on an economy and how young people can be supported and encouraged in such a tough climate and when resources are limited. I'm looking forward to learning more about the attitude to entrepreneurship in Greece and exploring any parallels to my experience of starting a business in the UK. It's an amazing experience to network internationally and I suspect the visiting entrepreneurs from around the world will be able to take a lot away from the event. 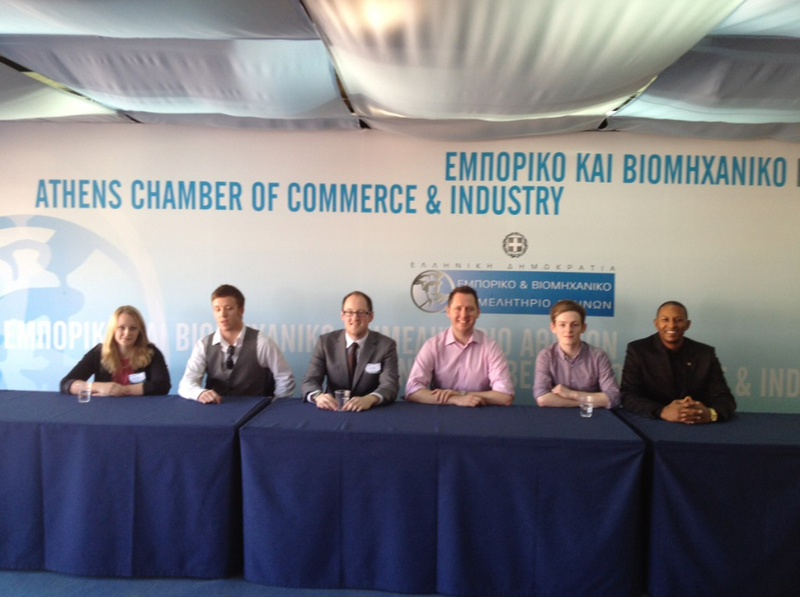 Similarly it will be really interesting to see if, as young British business owners, we can share any of the lessons we have learned along the way with Greek delegates to give them the confidence to pursue entrepreneurship in tough economic times. Looking forward to being a part of it.